In an effort to use up some scraps of pattern paper, I created the background for this card using the Collaged Circles Technique from the August Technique Junkie Newsletter. I added some distressing to the circles and edges then sponged on some Walnut Stain Distress Ink. 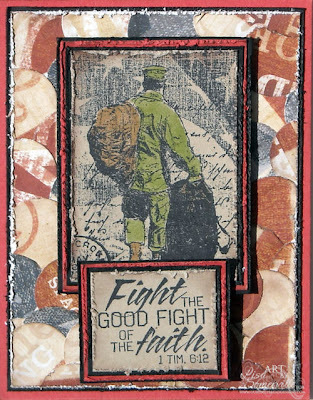 The image and sentiment are from Our Daily Bread Designs Not Forgotten set. The image is stamped in Black, then colored with Gamsol and colored pencils. Your background looks amazing on this card. Great use of your scraps. Great card, do luv the bg you cre8ted, fabby GF! The card has a nice vintage look to it. What a beautiful masculine creation!! I love the paper you used and the distressing!! Thanks for supporting the Shining the Light challenge this week!! It is so appreciated! Beautiful! Great sentiment and the image is touching. Lisa, great background technique and wonderful layout with the awesome image. 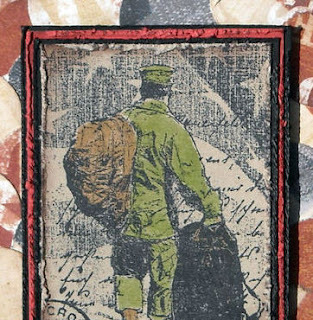 Awesome card, it sure depicts our men in the services and all the sacrifices they have made! !